Recover deleted/lost files from USB and memory card. Is there a better alternative to USB Flash Recovery? Is USB Flash Recovery really the best app in File Management category? Will USB Flash Recovery work good on macOS 10.13.4? Fully compatible with the new macOS 10.14 Mojave. Optimized scanning for the latest USB flash drives on macOS Mojave. Supports the latest HD video formats. Resolved some minor bugs and many other improvements. USB Flash Recovery needs a rating. Be the first to rate this app and get the discussion started! 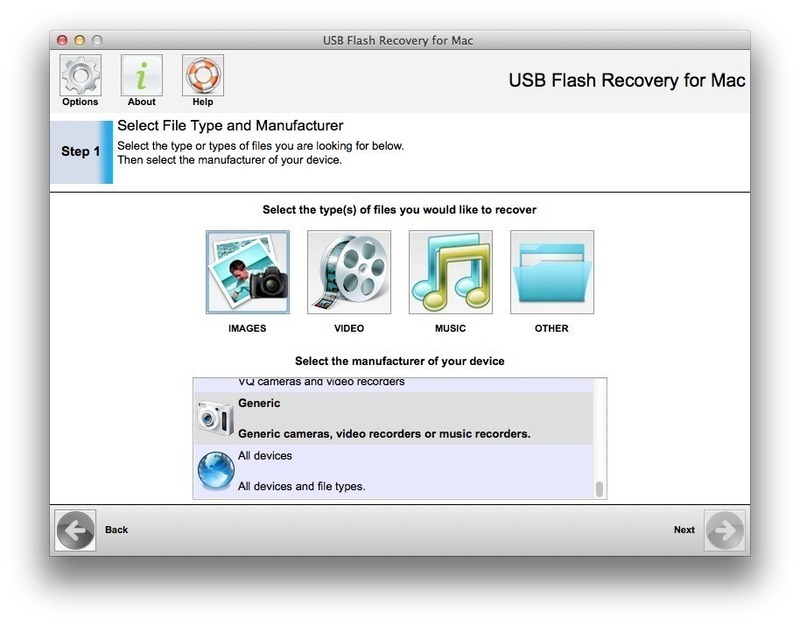 USB Flash Recovery is an easy and professional USB recovery software specially designed to recover photos, video, RAW images, documents, audio and other files from USB drives, digital camera, SD/XD/CF memory cards, and virtually any type of flash storage devices that works as removable storage. If your files were lost, unintentionally deleted, corrupted by viruses, or even if your digital media has been formatted. USB Flash Recovery can help you restore them safely and quickly. No prior data recovery experience needed. The simple and intuitive software features a wizard-driven user interface, allowing even novices to easily recover lost photos and video. Moreover, this recovery software supports recovery of high-end RAW images and HD videos that are generated by professional cameras such as Canon, Nikon, Olympus, Pentax, Fuji, Panasonic, GoPro, Sony, DJI drone cameras, and etc. Using USB Flash Recovery is 100% safe and risk-free. It recovers any files safely from different data loss cases on various removable devices without overwriting original files. It recovers the photos and other files from the source devices and saves them to the destination location you specify.